Wow! Sch�nes Spielmaterial, trotz (f�r mich) langweiliger Eisenbahnbauthematik sehr spannendes Spiel ohne den (aufgrund des massiven W�rfelpotentials) bef�rchteten zu hohen Gl�cksfaktor. Much more than a simple dice game with a railroad theme. There's lots to think about, and it's a rather unique system. 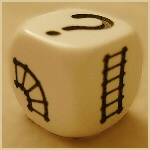 What I especially like about "Railroad Dice" is that it offers some unique rules which I have not seen in any game so far.